Hoo-boy! How hot it is outside! 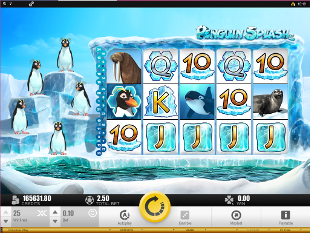 Let’s go to see charming penguins in Microgaming Antarctic and enjoy their funny dances each time you have a success. Seals and Walruses found their places on 5 reels and wait for you to come and take your gains. 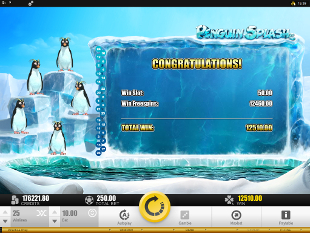 Penguin Splash Slot Machine takes you to chilly ice cellars and gives you a chance to hit large wins. What is better, you can use the no download version and relish the slot right from your browser connected to the Internet. All the ways are good, the most important thing is to manage not to fall from these 25 line ice-cakes. The favorite delicacy of all penguins and gamblers is Fish. This wild symbol is able to fill both your stomach and pocket at once. Replacing all ordinary icons, it creates more ways for you to hit a winning combination and obtain the profit! The only one who loves Fish more than you is the Penguin! This scatter symbol is a real cutie. It leads to great bonuses and cheers you up with his boffo dancing. The same freezing place can be more serious and dangerous like in Arctic Fortune Slot Machine. Get to know other ways to become wealthy and decide which one suits you best. Who says it is difficult and takes a long while to see Antarctic animals in the flesh? BAH! Just pick a coin size ranging from $0.01 up to $10 and your trip is on! No more than one coin you can place a line and make your first spin. The more you stake, the more you get! Remember it and do not hesitate when betting the max $250. Only in such a way you can become the owner of the top jackpot! All you need is just to catch 5 Whales on your line and $200,000 win is yours! 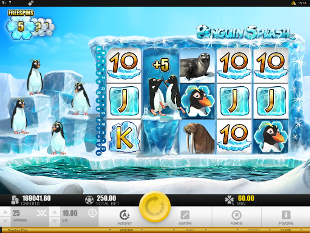 The main character of the slot and presently your beloved icon is Penguin! Watch this scatter landing on your screen for 3, 4 or 5 times and enter 15, 20 or 25 Free Spins! Each of these seabirds standing leftward presents you 5 Free Games and in case 2 of them stay on the ice floe, all your wins during the feature will be doubled! Cross your fingers for them not to fall into the water. Though, you can be lucky enough to catch more scatters during the feature and enjoy this circle of Free Games infinitely, having each time a chance to grab a multiplier. Collect more wins bobbing into Gamble Feature at the end of each fortunate spin. Just choose the right card color between red and black and in case you are correct, your score gets doubled! Be precision, you have only 5 gamble chances. Give it a try and prove how entertaining the cartoon characters are. 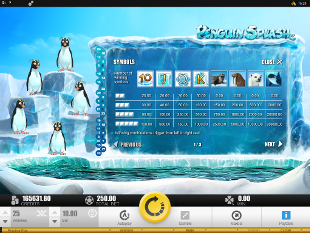 Join Penguin Splash Slot Machine and see for yourself how easy it is to relax and earn profits at the same time. So, load the slot and start your prosperous adventure right now!